Tanzania offers one of the finest fisheries left on the planet – Tigerfishing on the Mnyera and Ruhudji Rivers. This is the place if you’re looking to catch a big Tigerfish on the fly. The season runs from August to November (15 weeks) each year, with a maximum of 8 rods per week (4 rods per river). The early part of the season is good for big fish with less numbers and late season in better for more fish with a decrease in average size. Early season the water levels are higher and guests can expect to hook around 10 fish per day. During the later part of the season, water levels are lower and warmer, and this attract more small male fish into the system from floodplains downstream, accounting for the increase in smaller fish in the system. During this time, clients will expect to hook up to 20 or so fish per day. The strikes are violent and when a Tigerfish hits your fly, she’s moving at top speed. Due to the voracity, strength, and size of these fish, a 50% hook up to landed fish ratio is considered doing well. Tigersfish will actually hold the fly in their jaws for an entire fight, unhooked, only to open their mouth at the boat and spit the fly. Similar to Tarpon fishing, it’s all about the take, the acrobatic jumps, and the fight. The past 2 seasons on the Mnyera and Ruhudji were superb: 578 fish landed between 10 and 20 lbs and 31 fish breaking the magical 20lb mark. 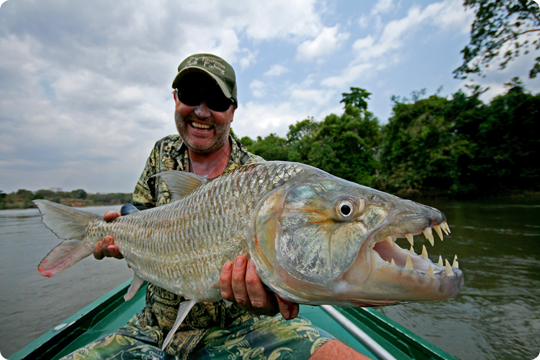 To put this in perspective, a trophy Tigerfish from any other river would be 12 pounds. 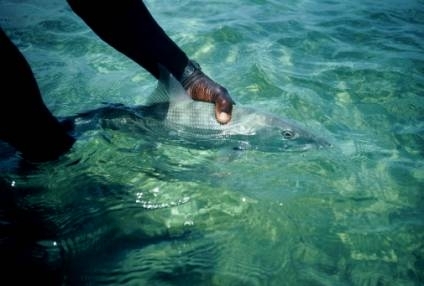 On the Mnyera and Ruhudji, the average fish is between 8 – 12 lbs. The cost for 7-nights / 6-days fishing is USD $6,750 per person person based on double occupancy accommodations and a shared boat / guide daily. 20 lb Tigerfish? I’d be smiling too! Angler Adventures has negotiated several value packed “2 for the price of 1” deals at some of our premier lodges. For more information, please click on the lodge name, or call us at 800-628-1447 (860-434-9624). Normal weekly price $3,250 per person, double occupancy / shared guide. Angler Adventures’ Special for November 2009: $1,625 per person double occupancy / shared guide. Excellent Bonefishing with good chances at Permit. Access to Gorda Cay and Mores Island. Normal weekly price $2,820 per person double occupancy / shared guide. Angler Adventures’ Special through February 2010: $1,813 per person double occupancy / shared guide. 30-miles off the coast of Belize. Only 6 spots currently available: 2 – November 7 – 14, 2009 & 4 – November 21 – 28, 2009. Normal weekly price $3,902.58 per person, double occupancy / shared guide. Angler Adventures’ Special: $2,573.09 per person double occupancy / shared guide. Direct access to Bonefishing in the Marls. Nice Accommodations and Gourmet Meals. Normal weekly price $6,800 per couple double occupancy / shared guide. 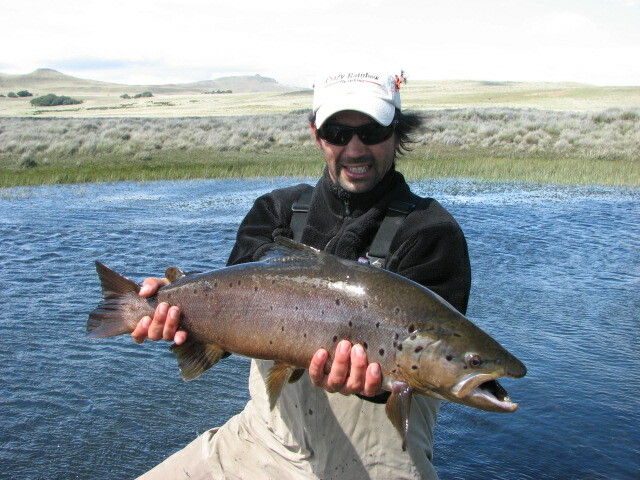 Angler Adventures’ Special, February 1st – March 15th, 2010: $4,250 per couple double occupancy / shared guide. Normal weekly price $3,085 per person double occupancy / shared guide. Angler Adventures’ Special for bookings confirmed before January 1, 2010: $1,962.50 per person double occupancy / shared guide. Experience Chilean Patagonia in luxury. Access to typically inaccessible fertile fishing grounds. Normal weekly price $17,850 per person double occupancy / shared guide. Angler Adventures’ Special: $8,925 per person double occupancy / shared guide. These discounts are offered to new reservations only and do not apply to existing reservations, nor date changes to existing reservations. Discounts for alternate times, or other lodges may be available. If the above offerings aren’t exactly what you’re looking for call us at 1-800-628-1447; and we’ll find you the best possible deal!